Food waste is a global issue. According to the United Nations Food and Agriculture Organization, roughly one third of all food produced in the world for human consumption is wasted every year, amounting to a staggering 1.3 billion tonnes. So much wastage makes very little sense. It squanders precious resources such as soil and water, is a drain on capital and labour, and does nothing to alleviate world hunger and malnutrition. Consequently, it is recognised in Sustainable Development Goal (SDG) 12.3 which aims to halve global food waste at the retail and consumer levels by 2030, as well as reduce food losses along production and supply chains. (See also Engaging businesses in Sustainable Development Goals). Champions 12.3 is a coalition of executives from across the food industry and related institutions dedicated to solving SDG12.3. In a series of reports looking at the business case for reducing food waste they suggested two reasons why the issue wasn’t taken more seriously. First, the cost of food waste was frequently well-hidden, often in operational costs, meaning that business leaders didn’t have visibility of its impact on the bottom line. Second, many believed that the cost of investment was too high. 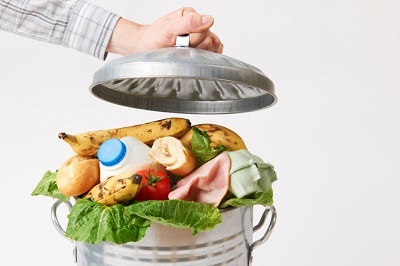 To counter this, the suite of reports looked at businesses that had implemented food waste programmes to see what return on investment could be achieved. In its 2018 report dedicated to the food service and catering industry, The Business Case for Reducing Food Loss and Waste: Catering, the research found that the average business cost-benefit ratio was more than 6:1 over a three-year timeframe, with the median cost-benefit ratio of 14:1 — ie for every £1 invested in food loss and waste reduction, companies saw a £14 return. The benefits were mostly realised through lower waste disposal costs, but also due to reductions in the amount of food bought. Alongside global efforts, the UK is also taking steps to achieve SDG12.3. Usefully, this means that for businesses looking to tackle food waste there is already a lot of support available. The most recent initiative is the Food Waste Reduction Roadmap . Developed by IDG and WRAP, this ambitious plan outlines how the UK food industry can meet its targets under SDG12.3. As part of the roadmap, organisations are encouraged to take three steps to target, measure and act. To implement these steps a toolkit has also been developed which includes measuring tools, such as waste calculators to track food waste, as well as guidance and advice. On top of this, the toolkit builds on WRAP’s pre-existing suite of resources including help as part of its “Your Business is Food; don’t throw it away” campaign, as well as resources designed to meet other commitments within the industry, such as the Courtauld 2025 food waste target and the 2015 Hospitality and Food Service Agreement (HaFSA). project boundaries (ie reporting by site or category). In the UK, the reduction of food waste is certainly starting to become more mainstream. Partly driven by an increase in kerbside food waste collections, as well as campaigns such as WRAP’s Love Food Hate Waste initiative, attitudes of consumers are changing. This, in turn, is being reflected in the expectations of staff who want to see their employers — and the contractors used — adopt good, sustainable and non-wasteful practices. Driven by these changes, as well as other factors such as cost and improving brand recognition, the food service sector has already identified waste as one of its key issues. Indeed, in the UK Hospitality’s Food Service 2018 Management Report leaders placed waste reduction as the second most important sustainability issue, behind nutrition and healthy eating. As such, most contractors should be on board with reducing waste and willing to work with you. Here are five steps to consider when looking to work more closely with your food service provider. Setting KPIs — Setting KPIs, or key performance indicators, is one way to monitor food waste within contracts. Consider setting targets after a full audit and review of operations to identify the causes of food waste and to ensure that the targets are ambitious but reasonable. A trial or pilot period is also useful if new processes or methods are to be adopted and adapted. Following the FLW standard, any KPI or trial should have clear boundaries, agreed definitions of the food waste that is to be included, and timeframes. Review waste collection contracts — A review of how waste is managed should be done with the food service provider to identify what the current waste collection offering is, as well as what other options are available. For example, there should be a food waste recycling stream but, if this is not possible, alternative options should be explored such as using on-site “rocket composters”. Collaborative initiatives — Speak with the contractor about any other initiatives or inter-organisation collaborations that could be fruitful. One example of such an initiative is the “Wasteful to Tasteful” project launched by catering services company Sodexo to use Grade B fruit and vegetables in dishes such as soups or stews. There are also charitable organisations which may be able to redistribute edible but unsellable food. New contractors —When engaging with a new contractor ask questions about how it manages food waste. For example, are menus designed with food waste in mind? Are catering staff trained to minimise food waste? How does the contractor manage its stock and food ordering? Does the organisation use monitoring technology to measure waste, or to anticipate demand? Determining customer expectations and changing behaviours — Understanding what staff want can be a crucial tool in reducing food waste. For example, do side dishes often go to waste, or would staff prefer smaller portions? Similarly, identifying ways of educating staff on how food waste is managed can help them make better decisions on what food they purchase and how they dispose of it. For example, encourage people to ask for smaller portions if they don’t want a full plate, or provide doggy bags for leftovers. Tackling food waste is not only an ethical issue, it also benefits the bottom line. Reducing wastage should be seen as a joint effort, involving everyone from on-site staff to the waste contractor. Any targets set should be agreed with the catering contractor, and potentially set following an audit and review to ensure that they are ambitious but achievable. Waste contracts should be reviewed to make sure they are fit-for-purpose and are in line with best practice for managing food waste. If not, consider alternatives, such as on-site composting. Research whether there are any local initiatives that could help reduce wastage. When choosing a new contractor, ask how it deals with food waste. Work with staff to determine what they want from the caterer to better predict demand, as well as to help change consumer behaviours.